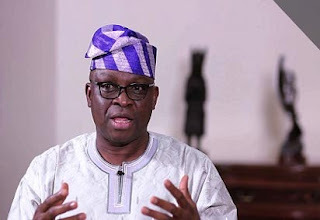 Fayose writes Chinese govt to stop FG’s $2bn loan request - BlogIT with OLIVIA!!! The Ekiti State Governor, Mr Ayodele Fayose, has called on Chinese Government not to accede to the request of the $2 billion loan being sought by the Federal Government of Nigeria. This was contained in a letter written to the Chinese Government by Governor Fayose on Thursday. Fayose said in the letter which was addrssed to President Xi Jinping of China, “The government of China should be mindful of the fact that Nigerians, irrespective of their political and religious affiliations are totally opposed to increment of the country’s debt burden, which is already being serviced with 25 per cent of the Federal Government annual budget. ” President Buhari’s visit to China this week was to discuss the development of the country’s infrastructure, including a $2 billion loan for railway projects. In the letter dated April 12, 2016, with reference number: EK/GOV/28/10, delivered by Fayose’s Chief of Staff, Barrister Dipo Anisulowo, in Abuja on Thursday, through the Chinese Ambassador to Nigeria, Gu Xiaojie, the Governor said some of the projects for which the loan was being sought were not captured in the controversial 2016 budget, which has been sent to President Buhari by the National Assembly for his assent. Anisulowo, who was with Deputy Speaker of the State Assembly, Segun Adewumi; Chairman of the House Committee on Information, Gboyega Aribisogan; Chairman of the House Committee on Health, Samuel Omotosho; and the Special Assistant to the Governor on Public Communications and New Media, Lere Olayinka, said Governor Fayose, who is in China, will deliver a copy of the letter directly to the Chinese President. The letter reads in part, “I write as one of the major stakeholders in the project Nigeria, and a governor of one of the federating units making up Nigeria, to draw your attention to report that the Federal Government of Nigeria is on the verge of obtaining a $2 billion loan from the Export-Import Bank of China. “This $2 billion loan is part of the N1.84 trillion the Federal Government of Nigeria has proposed to borrow to finance the 2016 budget, which is yet to be signed by the President, Muhammadu Buhari owing to unending controversies between the Executive and Legislative arms of government. “According to reports, Nigeria desires to raise about $5 billion abroad to cover part of its 2016 budget deficit. This is projected to hit N3 trillion ($15 billion) due to heavy infrastructure spending at a time when the slump in global oil prices has slashed the country’s export revenues. “Most importantly, Nigeria is presently servicing debt with about 25 per cent of its annual budget and what will happen to the economy in 2017, when the country will begin to service the additional debt to be incurred this year is better imagined than experienced.